Telecommunications satellites have simplified the placement of transoceanic calls, and that simplicity has resulted in such an increase in overseas calls that the size and power of the synchronous communications satellites used for international services have been expanded. Hughes Space and Communications Company, today known as Boeing Satellite Systems, built six Intelsat IVAs with improved telecommunications capacity to handle the rapidly increasing traffic. These satellites for the International Telecommunications Satellite Organization (INTELSAT) had the same basic structural design as their predecessors, the Intelsat IVs, but incorporated new antenna technology to provide approximately twice the capacity of Intelsat IV. This twofold increase in capacity was attained by reusing the same frequency through antenna spot beam separation. The antenna provided coverage of land masses on both sides of the Atlantic basin with four spot beams and had sufficient isolation between the eastern beams and the western beams to use the same frequencies in the east and west. Beam separation by directional antenna permitted this double use of the frequency, significantly increasing satellite communications capability within an allocated frequency band. While the initial Intelsat IVA requirement was for Atlantic service, careful attention was given during the design of the satellite to providing service over the Indian and Pacific oceans as well. Each Intelsat IVA had 20 transponders (individual radio repeaters) compared to 12 aboard each Intelsat IV. Intelsat IVAs over the Atlantic Ocean used 4 transponders for wide beam coverage, focusing on an area slightly larger than one-third of the world's surface--the area visible to the satellite. The remaining 16 transponders were used in the spot beam mode, where the satellite's power was concentrated on smaller selected areas within the satellite's coverage. Intelsat IVAs over the Indian Ocean had the ability to switch two of their narrow beam channels to wide beam channels to cover the large number of countries they served. Communications Satellite Corporation (COMSAT) served as management services contractor for the then 109-country INTELSAT organization. Member nations, plus other countries, territories, and possessions, lease circuits in INTELSAT satellites on a full-time basis, using over 1000 satellite communications pathways provided by over 240 antennas at 173 Earth stations located in 146 countries. The Intelsat IVA had an overall height of 22 feet, 11 inches (7.01 meters) and a diameter of 7 feet, 9 inches (2.38 meters). The spacecraft solar panels, covered with nearly 17,000 solar cells, provided primary power of 600 Watts. Liftoff weight of the satellite, which had a design life in orbit of 7 years, was about 3335 pounds (1515 kg). The Intelsat IVA launch vehicle was the Atlas-SLV3D Centaur-D1AR. The first satellite in the series was launched by NASA from Cape Canaveral on 25 September 1975; the second 29 January 1976; and the third 26 May 1977. The launch vehicle carrying the fourth Intelsat IVA began breaking up and was destroyed shortly after launch on September 29, 1977. 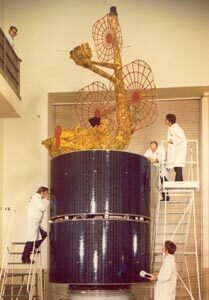 The last two Intelsat IVAs were successfully launched on January 6 and March 31, 1978. All five satellites have been retired and operated an average of nearly 4 years beyond their design lives.